This February Bubble Club got flirty, friendly and funny with Get to Know You games from Happily (a Friendship & Dating agency for Learning disabled and autistic adults), joined by Channel 4’s Undateables dating guru Helana Reed! Once everyone had warmed up and let loose We were treated by a red-hot performance from the futuristic love vibrations of band ‘Too Hot for Candy’ that really sent the crowd spinning! The 360 love machine turned round and round, celebrity destinies were found, and love and frienship was all around! One lucky raffle prize winner has a lavish dinner for two at the very classy Jones Family Project, and he’s taking the loveliest woman in the world out for this incredible treat - his mum :) Good lad! Freestylers from the audience got to strut their stuff on the mic, and everybody went home with a warm and fuzzy feeling in their hearts! 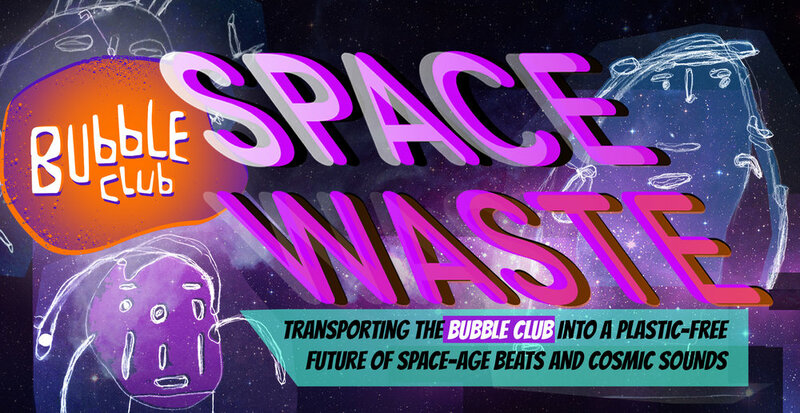 At the latest Bubble Club, we saw a blast from the future and it was covered in plastic!! Artwork made from London’s plastic trash hung from the ceiling, clad the walls and surrounded the stage as a line up of awesome musicians and DJ’s kept the dance floor pumping! On the line up was: ANGRY DAN, T-WAY (Bubble Club), DJ SHALIM (Heart n Soul) & LLOYDY RANKS (Wild Bunch). Electric Fire were set to headline, but after they dropped out in the last minute, none other than DEAN RODNEY of the Fish Police stepped in to land a solo performance that stunned all present. For a full run down of the show, be sure to listen back to our December Radio broadcast available on the Radio page of this website. Wow, what an amazing evening! At a different venue from usual but with all the same positive energy and inclusive atmosphere as we are used to at the Backyard. On the Line-up was Hype Man Sage, Too Many T’s, DJ4Blue & T-Way… It was EPIC!! We also has Daisy May teaching the crowd her brilliant dance routines at the beginning of the night, a very exciting raffle and a whole room just for arts n crafts. So much fun, thank you all who came and if you missed it please come along to the next one, everyone is welcome!! DANCING in celebration of the 100 years since the first British women got the vote! Guests hit the dance floor feeling empowered and with no glass ceiling in sight our wonderful all-female line-up DJs, live music from holden y su banda rallied the crowd and our amazing girl power dance troupe rocked the crowd to a rebellious and climactic dance tunnel! Woah! Bubble Clubs own Shola and Rufaro both to perform raps and big ups on stage to rapturous applause, the vibe was totally revolutionary. CHECK OUT HOLLY HOLDEN Y SU BANDA HERE! Bethnal Green felt a warm tropical breath of fresh air this week as the Bubble Club team presented Magic Paradise Pineapple Island. While professional roller skater and world record breaking hula-hooper Symone glided around the dance floor, party goers enjoyed an amazing live loop performance from musician Bunty. Playing all the best hits inbetween were our amazing Bubble Club residents, DJ Superstyler, DJ Awesome and DJ T-WAY, it was incredible!! Our management team really rolled up their sleeves to create a magical island dream - giant pineapples, a friendly octopus, flamingoes and palm trees were all hand made, and we really felt like we were on holiday! The action wasn’t all on the dance floor either, there was a coconut shy, pineapple art sessions and other fun activities too. One thing we learned that night is that its impossible to resist dancing when the electric slide comes on the speakers!